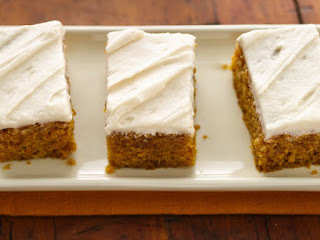 I wanted to post this recipe for "White Whole Wheat Pumpkin Bars". You will LOVE these as they are pretty and sweet. Enjoy these spiced, moist, cake-like bars with a delicously creamy cream cheese frosting. Heat oven to 350°F. Lightly grease bottom and sides of 15x10x1-inch pan with shortening. In large bowl, beat eggs, granulated sugar, oil and pumpkin with electric mixer on medium speed until smooth. Stir in flour, baking powder, cinnamon, baking soda, salt, ginger and cloves. Spread in pan. Bake 25 to 30 minutes or until golden brown. Cool completely in pan on cooling rack, about 2 hours. In medium bowl, beat cream cheese, butter and vanilla with electric mixer on low speed until smooth. Gradually beat in powdered sugar, 1 cup at a time, until smooth and spreadable. Frost bars. Cut into 7 rows by 7 rows. Store covered in refrigerator. *Check labels carefully when buying canned pumpkin. Two kinds are available: plain pumpkin, with no added sugar or spices, and pumpkin pie mix, which has sugar and spices.